“It would have been totally unacceptable for a community to wake up the next the day and find out, ‘Enoch’s wife died last night and Addie’s already in the ground,’” said Marty Mitchell, Funeral Director of Mitchell Funeral Home in Marshalltown, Iowa. Marty has extensive knowledge of turn-of-the-century burial customs, and has an amazing collection of artifacts from that period. For the last few days, I’ve been methodically reading the Lake Mills Leader newspaper on microfilm. Thus far, I’ve read from 1894-1898. And how many of those 75+ obituaries had same-day burials (as in, within 24 hours)? Although I’ve not yet sat down and tallied up the precise numbers, there were a few deaths from typhoid, pneumonia, grippe (flu), and consumption (TB), all of which were considered communicable diseases. All of those folks - rich and poor - had proper funeral services, spanning a period of two, three or four days (from death to burial). Not one of these obituaries tell a bizarre story like Addie’s, of dying in the wee hours and being buried the same morning. Then again, none of these people were married to Enoch James Fargo. To learn more about Victorian-era funeral customs, click here. Addie was buried on June 19th, 1901 in a shallow, hastily dug grave. 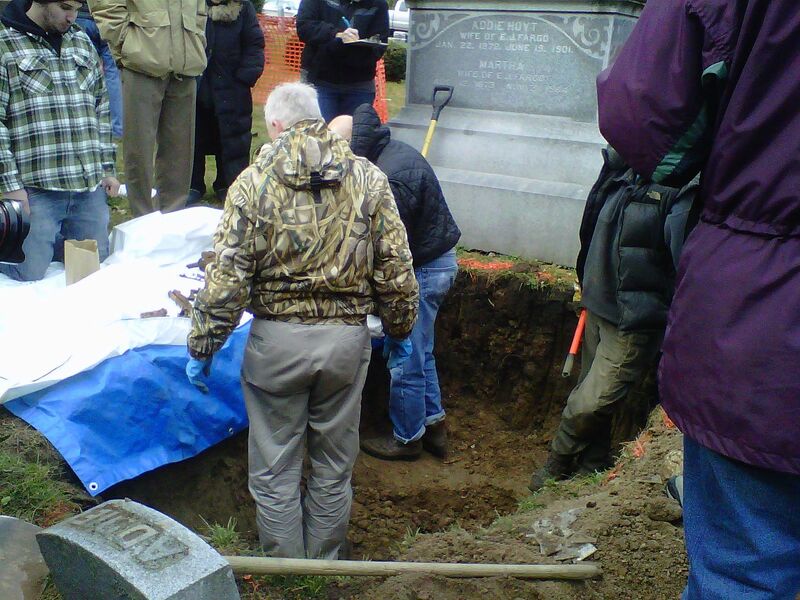 On November 3, 2011, her body was exhumed. Her remains are now in Norfolk, VA (with her family). Charles Ives died from Typhoid in September 1898. 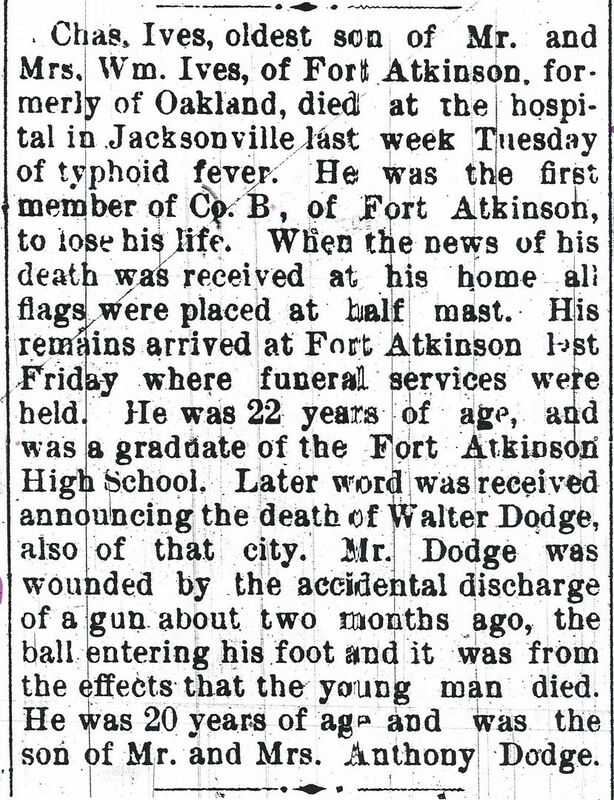 It was also considered a highly contagious disease, and yet he was transported by train and buried three days after death. At the time of Addie's death (June 1901), Oatway was still a neophyte. 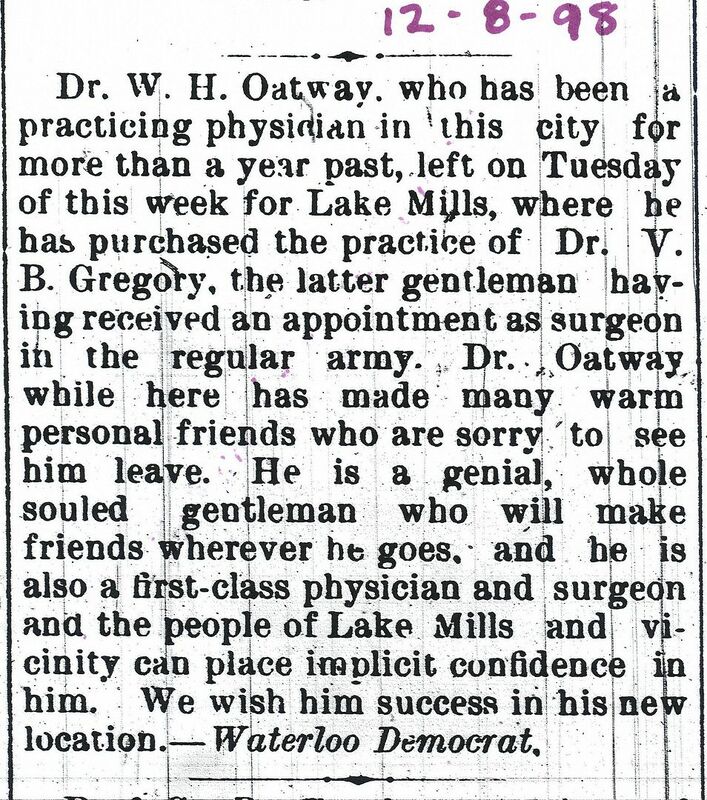 He'd been a doctor for 2-1/2 years in June 1901 (when Addie died) He'd started his practice the year before in Waterloo. Good old genial Dr. Oatway. As mentioned in another blog, the anti-toxin was in use by 1895. 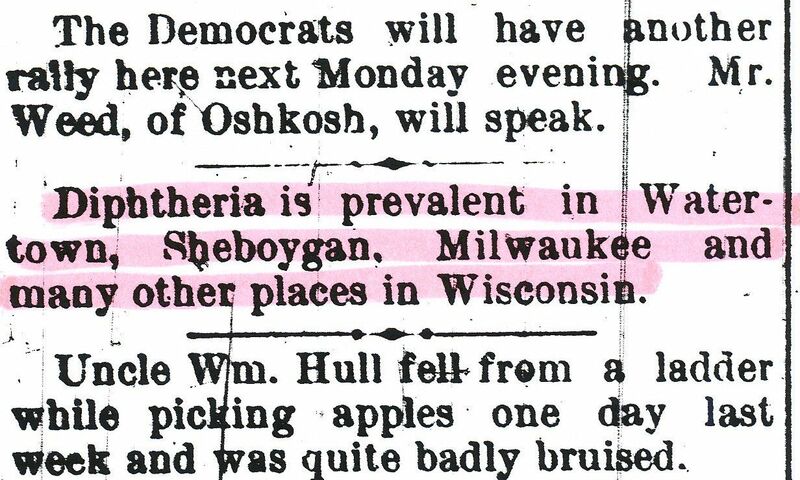 (The article above is from the "Lake Mills Leader," December 19, 1895.) If Addie *did* have diphtheria - which she did NOT - this anti-toxin had already proven itself to be a good remedy. About 90% of the adults who contracted diphtheria survived it. The 10% who perished typically died when the bacteria made its way to their heart or lungs. No one - young or old - died from diphtheria in 15 hours. It took several *days* for the diphtheritic membrane to form, and it was the formation of the membrane (and obstruction of the airway) that killed children. When diphtheria was present in a community, the news spread far and wide, and not surprisingly, it was found in batches. In all my reading, I've yet to find a report of a single isolated case of diphtheria. 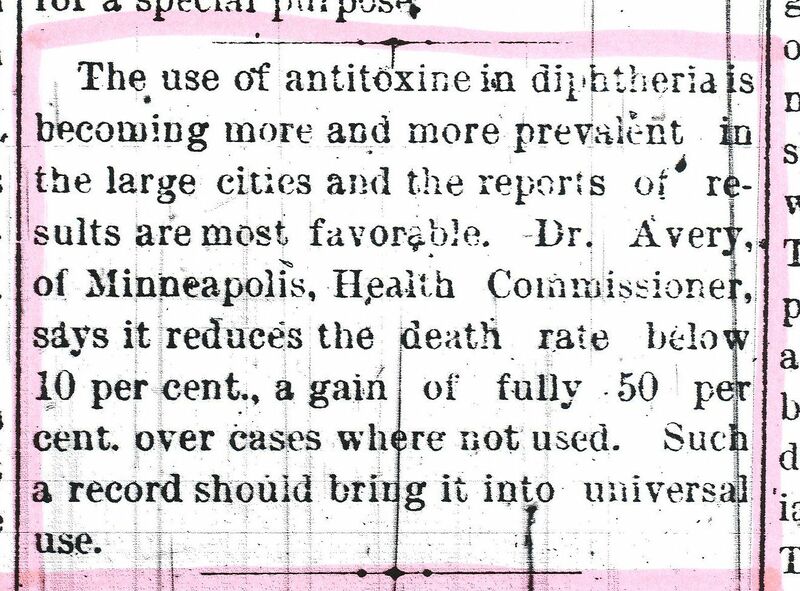 As mentioned elsewhere, in 1901, the mortality rate for an adult with diphtheria was 9.1%. Almost 90% of the people who contracted diphtheria (more than six and less than 40 years old) survived it. 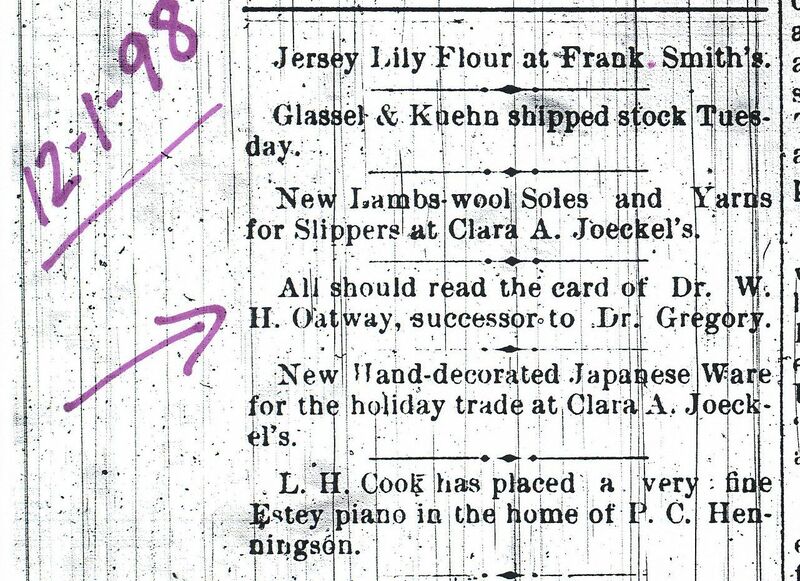 This snippet appeared October 1896. 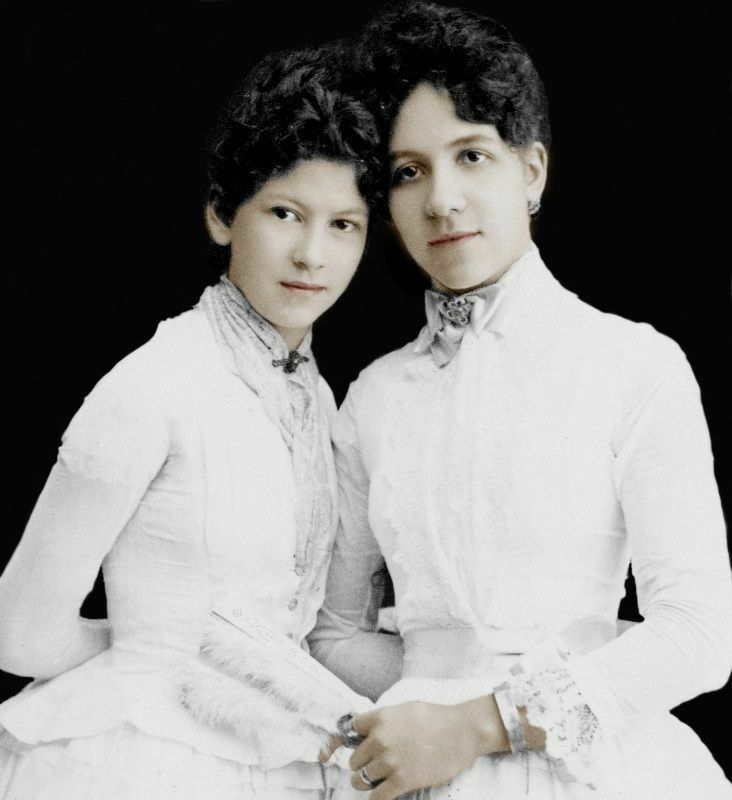 Addie and Annie, about 1887. Addie was 15 years old here, and her life was half over. To read more about what Elsie Fargo told her daughter, click here. Amazing research, Rose. I don’t know how anyone could still believe poor Addie died of diphtheria. There is just no way. I wonder if we’ll ever know exactly what happened that night at the Fargo Mansion. Great job on the research Rosemary! You are BRILLIANT Follow the paper trail…it leads right to the proof that Addie did not die from diphtheria! I wonder where in Lake Mills Dr. Oatway did his personnel and business banking. I wonder if any records survive, if they do,a large deposit soon after the event may indicate compensation from Fargo for the Doctor’s help. Or possibly the Oatway’s purchase of a new home, farm, or other property soon after these events might indicate he was paid for his help in the cover up. Property records usually survive pretty consistently. Another possible idea would be to metal detect the Fargo property looking for a buried handgun. I wonder if Dr.Oatway and Mr. Fargo were in the Masons or one of the many other fraternal societies existing in the 1890s. Members of these orders were required to help one another and great pressure may have been put on the Dr. to do this cover-up. I heard the Dr. confessed at one point-I wonder if that story has been verified? I have also heard many stories over the years about guns, money bundles of secret love letters, etc. being hidden in the spaces that exist behind built in buffets and butler’s pantries which were common in homes of this era. These are probably all ideas you’ve had or heard already. I hope you continue to make discoveries that lead to the truth.